ANNOUNCEMENT: The AFB Podcast joins The Bigtop Network! As we gear up for the 50th episode of the AFB Podcast, we have some exciting news, prizes and guests lined up, but one announcement just can't wait! We are pleased to announce that The AFB Podcast is now a part of The Bigtop Network! The Bigtop Network is an independent audio community network of podcasters, and AFB is very proud to have been invited to join this new group! Nothing will change for our listeners, other than that you will now hear the Bigtop Network tag at the very end of our shows, and we will have the opportunity to cross over and make links with other network shows when it's appropriate - or just plain fun! If you'd like to check out the other Bigtop Network shows, please head over to their Facebook page and "like" it while you're there! 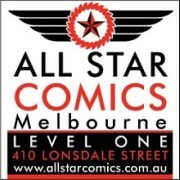 The line-up is currently all Australian based, so if you love listening to Aussies talk about geek stuff, you'll be heading the right place! We at AFB are very excited to be working with the gang from The Bigtop!